Why can a simple creature like an oyster, clam, or abablone make such a beautiful material as “mother of pearl” from sand and sea water? And then, why is it so strong “3,000 times more fracture resistant than the mineral from which it is made, aragonite”? Nacre — or mother of pearl, scientists and artisans know, is one of nature”s amazing utilitarian materials. 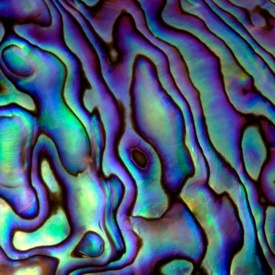 Mother of pearl or nacre, such as this from a New Zealand Paua shell, is one of nature’s wonder materials. Made by a host of mollusks, the material has proven to be an accurate barometer of environmental conditions as signatures of both water temperature and water depth reside in the material, according to new research by UW-Madison professor of physics and chemistry Pupa Gilbert. Produced by a multitude of mollusk species, nacre is widely used in jewelry and art. It is inlaid into musical instruments, furniture and decorative boxes. Fashioned into buttons, beads and a host of functional objects from pens to flatware, mother of pearl lends a lustrous iridescence to everyday objects. In recent years, subjecting the material to the modern tools of scientific analysis, scientists have divined the fine points of nacre architecture and developed models to help explain its astonishing durability: 3,000 times more fracture resistant than the mineral from which it is made, aragonite. Now, in a new report (Thursday, Feb. 16) in the Journal of the American Chemical Society (JACS), scientists from the University of Wisconsin-Madison show that nacre can also be deployed in the interest of science as a hard-wired thermometer and pressure sensor, revealing both the temperature and ocean depth at which the material formed. The new study was conducted using mother of pearl from modern mollusks, but Gilbert notes that nacre is widespread in the fossil record going back 450 million years. If the techniques used by the Wisconsin group can be applied to fossil nacre, scientists can begin to accurately reconstruct a global record of ancient environments and environmental change. “If the correlation holds, we would have a thermometer that goes back in time, a paleothermometer of how hot or cold water temperatures were when the nacre formed,” says Gilbert. The material also holds a distinctive signature-the thickness of the nacre layers — for the water depth at which the material was assembled by a mollusk, potentially providing even more insight into environmental conditions of the present and past. “These are two independent parameters, measured by different aspects of nacre structure,” the Wisconsin physicist explains. Working with UW-Madison graduate student Ian C. Olson, the lead author of the JACS report, Gilbert subjected nacre from eight mollusk species from different environments to a technique capable of mapping the orientation of nacre crystals. From the different shells, they observed uneven thicknesses, widths and angles of the crystalline “bricks” that, together with an organic mortar, are laid down by the mollusk to form mother of pearl. “We wondered why the shells were so different and concluded that the key parameters to test were the environmental ones, including maximum, minimum and mean annual temperatures as well as maximum and minimum water pressure, which depends on water depth,” says Gilbert. Comparing the structural maps of nacre from the different mollusks and environmental data from the places where the animals were collected, Olson, Gilbert and their collaborators found an extremely high correlation between the microscopic structural characteristics of their nacre specimens and the temperature and pressure data obtained from the various environments where they were collected. Contributing to the new study were and , both of the UW-Madison department of geoscience. The work was funded by the U.S. National Science Foundation.